Despite some misgivings about the flick, I decided to give it another shot on Blu-ray. Now that I've seen the film a few times, I must amend my earlier impression. While the opening scene still stuns, most of the rest of the movie delivers the goods as well. 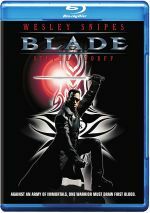 When Blade goes on his "final attack" during the final 15 minutes, those scenes seem as good as almost any from the opening hour, and they help compensate for the less-scintillating nature of the previous 45 minutes. 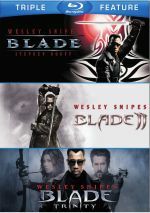 Blade appears in an aspect ratio of approximately 2.35:1 on this Blu-ray Disc. This became a satisfying presentation. Sharpness worked fine. A couple of wide shots showed a smidgen of softness, but the majority of the film appeared accurate and well-defined. I saw no issues with jaggies or shimmering, and both edge haloes and print flaws remained absent. Colors worked fine. The movie went with a chilly blue palette most of the time, and the hues seemed concise within those parameters. Blacks were dense and dark, and low-light shots offered nice clarity. In the end, the image seemed pleasing. Blade also featured a pretty strong DTS-HD MA 5.1 soundtrack, as the soundfield created an active and engaging piece. The lively score showed excellent stereo presence, while all five channels provided a natural and realistic environment. Audio quality seemed fine. Dialogue appeared natural and warm, with no issues related to intelligibility or edginess. Music sounded bright and vibrant, as the score and songs showed strong fidelity and offered tight and taut bass response. Effects also seemed accurate and dynamic, and low-end sounded deep and rich. Blade provided a quality soundtrack. How did the Blu-ray compare to the original 1998 DVD? Audio seemed fuller and warmer, without some of the mild distortion from the DVD. Visuals seemed tighter and better defined as well. This turned into a good upgrade. The Blu-ray includes most of the DVD’s extras, and we start with an audio commentary from actor and producer Wesley Snipes, actor Stephen Dorff, writer David S. Goyer, director of photography Theo Van De Sande, production designer Kirk M. Petrocelli, and producer Peter Frankfurt. All were recorded separately for this edited track. Many dislike that format, but I think it works well, especially when handled as well as it is here. Next we get Designing Blade. At 22 minutes, 31 seconds, this program offers the longest of the video materials as it discusses different aspects of the visual production. We hear from production designer Kirk M. Petrocelli, makeup effects creator Greg Cannom, stunt coordinator Jeff Ward, and special effects producer Richard “Dr.” Baily as each discusses his specialty. For information about the history of vampires, look no further than The Blood Tide, a 20-minute, two-second program. It includes comments from Father Gregory Coiro, UCLA Associate Professor of Medicine Dr. Gary Schiller, author Dr. J. Gordon Melton, author Nina Auerbach, screenwriter David Goyer, filmmaker Brian Clemens, and author Mick Farren. The set ends with the film’s trailer. Absent from the DVD: an isolated score/composer commentary, a “Pencil to Post” featurette, and some text/stillframe materials. Of these, the score/commentary becomes the biggest loss. 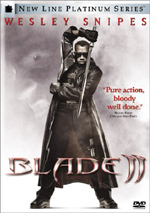 Back in 1998, Blade came out of nowhere and managed to become a modest hit. It deserved its success, as the wild vampire flick offers a lively, vivid comic book adventure. The Blu-ray presents solid picture and audio along with a fairly informative set of supplements, though we lose some from the DVD. Despite the missing bonus materials, the upgrade in picture and audio makes this the Blade to own.